Suspect dies in deputy-involved shooting in Buckeye. 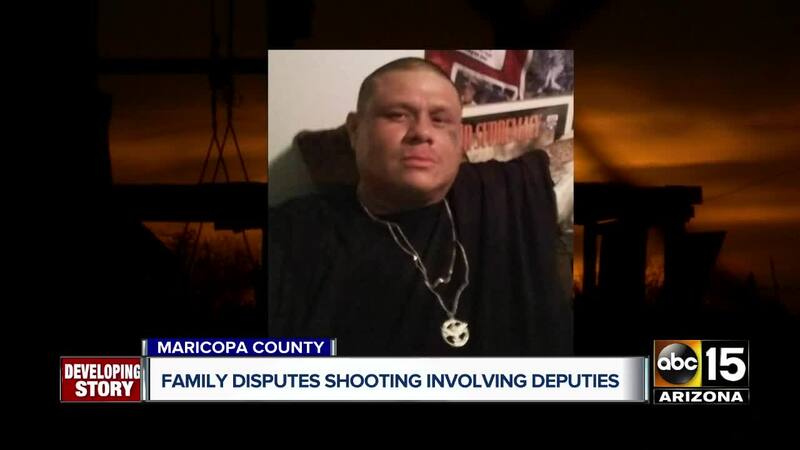 BUCKEYE, AZ — A Valley family is disputing the Maricopa County Sheriff's Office's account of their loved one's death last week. On April 12, just before midnight, two MCSO deputies shot and killed 39-year-old Juan Torres at his parent's home in Buckeye. After an argument, Vanessa Torres called 911 to report her brother Juan Torres. "We told the dispatchers he is not mentally stable. He was having a bad day. And we would really like help to get him to an institution," said Vanessa. Two MCSO deputies arrived to the "domestic dispute" and encountered Torres in the backyard. Multiple family members witnessed what happened when deputies began talking with Torres. "At first they approached my brother and said, 'Juan we are here to help you,'" said his other sister, Irma. "He was just asking, 'I need help, you know that I want help,'" said Vanessa. "He tossed the wrench towards this officer here. He started shooting and then he started shooting," said Ricardo Torres, Juan's Dad. "As soon as the wrench left his hands, they started shooting him. And he went down," said Irma. "I was yelling 'Stop! Stop!' And they just kept on firing until he went down," said Ricardo. MCSO said in a press release that the wrench "struck one of the deputies." The family says they never saw the deputy struck or injured. Deputies also said that Juan "then approached the deputies with a hammer and both deputies then discharged their service weapons." The family told ABC15 that Juan never advanced, or even had the chance to because he was shot so quickly. Juan did not die immediately. "He was responding to them. [Deputies] were asking Juan 'Where were you shot? Where were you hit?'" said his family. Those are questions his relatives still do not have answers to, despite asking repeatedly. "We don’t know where he was shot, we don’t know how many times he was shot," said Irma. The sisters say the deputies fired nearly a dozen rounds. "[Detectives] picked up 10 [shell] casings from here," said Irma, referencing the backyard. Juan was supposed to have another mental evaluation done just hours before his death. He missed the appointment. His family was hoping to visit him this week at a mental hospital. Instead it will be at the medical examiner’s office. "Never in a million years when I called the sheriff's office to come to help my brother did I think that I was going to see my brother shot and killed in my parent's backyard," said Vanessa. MCSO says they were not able to comment on the number of times Torres was shot or how many shots deputies fired. A spokesperson said both deputies were wearing body cameras. It is unknown the quality of the footage or if both cameras were recording at the time of the incident. The internal investigation is ongoing. The family has setup a GoFundMe for funeral expenses. If you would like to donate, please visit their website.